Bring back a diner favorite with a new twist when you make our BBQ Patty Melt Recipe. Topped with onions and a KRAFT Singles, our BBQ Patty Melt Recipe includes barbecue sauce for an extra burst of flavor. 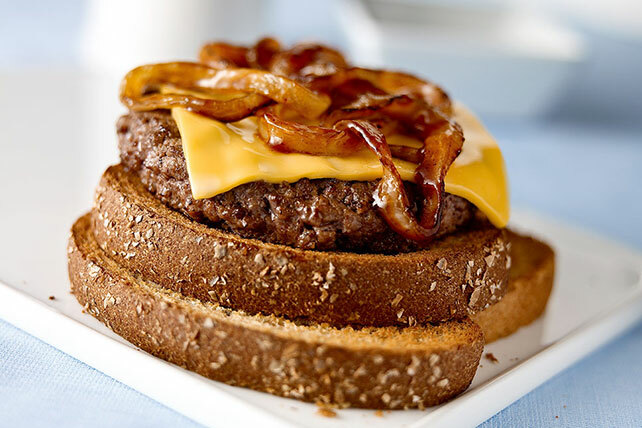 Try our delicious BBQ Patty Melt Recipe to find out for yourself. Heat oil in large nonstick skillet on medium-high heat. Add onions; cook 8 min. or until golden brown, stirring frequently and adding barbecue sauce the last few minutes. Remove onions from skillet; set aside. Carefully wipe skillet clean with paper towel. Shape meat into 4 (1/2-inch-thick) patties. Add to skillet; cook on medium heat 4 to 5 min. on each side or until done (160ºF). Top with Singles; cook 1 min. or until melted. Fill toast slices with burgers and onions to make 4 sandwiches.